s in this system and know the ways to prevent hackers from getting ahold of their banking information. Naked Security recently published an article outlining 8 tips for safer online banking. By following these tips, users can minimize risks to the security of their financial accounts. 1. Choose a bank account that offers some form of two factor authentication for online banking, such as a key code or unique image. 2. Create a strong password, avoiding common words or phrases, and change it every few months. Also, for security questions, the answer does not have to be the real answer, just one you will remember. 3. Keep your security software (anti-virus, firewall, etc. ), operating system, and other software up-to-date to ensure that there are no security holes present when using your computer for online banking. 4. Beware of suspicious emails and phone calls that appear to be from your bank asking for account information. Access your online bank account directly by typing the address into your browser and call your bank back via a number that you are familiar with and you know is legitimate. 5. Access your accounts from a secure location, using computers and networks you know are safe and secure. Avoid using public networks and always look for the padlock icon in the corner of the browser, signaling that the website is encrypted. 6. Always log out and clear your computer’s cache at the end of each session. 7. Set up account notifications to immediately alert you if there is any suspicious activity on the account, such as large withdrawals or a low remaining balance. 8. Monitor your accounts regularly, paying attention to all transactions over the past few months. In general, bankers who take advantage of online banking services should be aware that technology, the Internet, and networks are not totally safe. Online banking is a great and convenient service, however those who use it must always be alert and aware of their financial accounts and possible hacking attempts. The above is an excerpt adapted from the article,”8 Important Tips for Safe Online Banking.” For more information, please visit www.bbb.org. This is an excerpt from the article “Halloween Fire Safety Tips.” For more information, please visit www.nfpa.org. You or your loved ones are more likely to be injured due to a red-light running related crash than any other type of crash1. Running red lights or other traffic controls is the most common cause of all urban crashes2. Someone runs a red light an average of every 20 minutes at urban intersections3. … and the leading cause of death for children, teens and young adults up to age 3410. In the last decade, red-light running crashes killed nearly 9,000 people4. An estimated 165,000 motorists, cyclists, and pedestrians are injured annually by red-light runners5. Half of the people killed by red-light runners are not the signal violators — they are passengers, other motorists, pedestrians, and cyclists6. Nearly 93% of drivers believe running a red light is unacceptable, yet 1 in 3 drivers reported doing so in the past 30 days7. There are an average of 7 fatal crashes and over 1,000 injury crashes EVERY DAY at signalized intersections across the United States8. The cost to society of all crashes exceeds $230 billion annually9. The tragedies and costs resulting from red-light running are preventable! 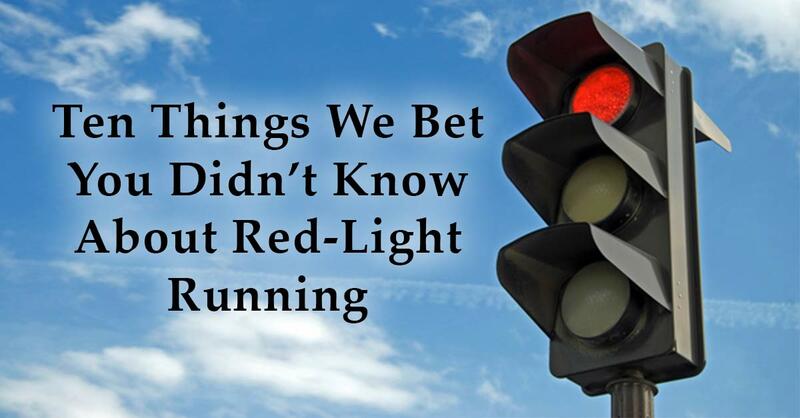 The above is an excerpt adapted from the article, “Ten Things We Bet You Didn’t Know About Red-Light Running.” For more information, please visit safety.fhwa.dot.gov. This is a Halloween Public Service Announcement (PSA) from the Occupational Safety Project. Enjoy! Insider Crime – Many businesses put a great deal of effort into protecting their property from theft by outsiders but neglect to put an equal effort into preventing insider theft. Employers should not underestimate the risk of trusted employees stealing from the company. Loss control experts at the Association of Certified Fraud Examiners (ACFE) encourage employers to adopt two strategies to prevent internal theft: increase the perceived probability of discovery and decrease the probability that an employee will commit the crime. The ACFE recommends stringent accounting controls, which your accountant can help you create, and frequent audits. Having a policy that gives honest employees a way to report theft by their co-workers without fear of reprisal helps cut down insider theft, as does emphasis on ethical practices, rewarding company loyalty and having clear performance standards. Identity Theft – Identity theft occurs when an individual uses someone else’s personal information to commit fraud. Federal law requires businesses to provide identity theft victims with transaction records relating to their identity theft free of charge. The above is an excerpt adapted from the article, “Reducing Vulnerability To Theft.” For more information, please visit www.iii.org. The National Highway Traffic Safety Administration is reminding both motorists and pedestrians to use extra caution on Halloween night. Nationwide, Halloween is a particularly deadly night due to the high number of drunk drivers on the roads and the increase in pedestrians during the evening hours. In 2011, 38 percent of fatalities on Halloween night occurred in a crash involving a driver or a motorcyclist with a BAC of .08 or higher and 11 percent of those fatalities involved a pedestrian. In fact, over the five years from 2007-2011, 23 percent of pedestrian fatalities on Halloween night involved a drunk driver. NHTSA offers the following safety tips to help ensure a safer Halloween. Use caution while behind the wheel. Slow down and be alert in residential areas. Eliminate distractions so you can concentrate on the road and your surroundings. Always designate a sober driver and plan a way to safely get home at the end of the night if you plan on celebrating Halloween with alcohol. Use your community’s sober ride program or take a taxi, call a sober friend or family member, or use public transportation. Watch out for your family, friends, and neighbors. If you know someone who is about to drive or ride while impaired, take their keys and help them make safe travel arrangements to where they are going. Walking impaired can be just as dangerous as drunk driving. Designate a sober friend to walk you home. Children out at night and under the age of 12 should have adult supervision. Kids should stick to familiar areas that are well lit and trick-or-treat in groups. Choose face paint when possible instead of masks, which can obstruct a child’s vision. Decorate costumes with reflective tape and have kids carry glow sticks or flashlights. Remember, everyone is a pedestrian. The above is an excerpt adapted from the article, “NHTSA Offers Halloween Safety Tips ” For more information, please visit www.nhtsa.gov. The above is an excerpt adapted from the article, “Halloween Safety Tips” For more information, please visit www.safekids.org. Businesses face various types of theft, including burglary and robbery by outsiders, theft by insiders and identity theft. Burglary – Burglary refers to crimes involving the unlawful entry of a structure with or without force. Burglary prevention starts with making your premises an unattractive target by creating barriers to illicit entry. Appropriate measures will vary depending on the type of business, the premises and the location. For some businesses, security needs may be met simply by leasing a professional office in a building with good security and assuring there are strong doors and appropriate locks. This is particularly true for organizations in low-crime areas without high-value goods on the premises. An enterprise in a building with numerous entrances and windows, located in an area with a high-crime rate and having high-value goods on hand presents a different picture. Whatever type of business you have, your insurance agent, locksmith, police department and a security consultant can provide information on how to make your premises harder to burgle. They may recommend such improvements as steel doors that fit tightly into doorframes, shatterproof window glass, stronger window locks and a fence around the premises. Exterior lighting deters burglars. The fewer dark places around your facility, the better. Don’t let trees or shrubs grow around windows. These provide an opportunity for criminals to conceal what they are doing. Keep dumpsters away from the building. Valuable property should be locked up to further deter theft. You may want to invest in an alarm system that rings in the police station or at a private security firm. Robbery – Robberies involve the taking of valuables from another person(s) by force or threat of force. If you receive cash in your business, train employees what to do in case of robbery. Your local police department can assist you in developing training material. Limit the amounts of cash in cash registers. The above is an excerpt adapted from the article, “Before You Purchase Commercial Auto Business Insurance.” For more information, please visit www.about.com. Trick or Treating safety is important on Halloween night. Learn how to keep safe outside while trick or treating in this free child safety video eVillage’s Halloween expert.